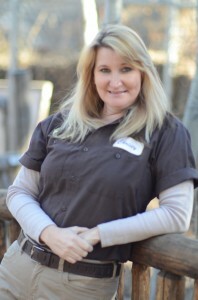 I have worked at the zoo for one half of my life. I have dedicated myself to taking care of the animals that are unable to care for themselves and I am continually attending classes to learn more about the animals in our care. It really is a dream job to work outside and be surrounded by those that depend on you for their survival. Animals don’t play games, they either like you or they don’t and I respect that aspect of them. My favorite part of my position is raising orphan animals and releasing them back in to the wild. To give them a second chance is a really great experience. When asked to pick my favorite animal, that is almost impossible to answer. They are all very special in their own way as I have been at the zoo when most of them came here to live. Zuni the black bear and I used to rub bellies when I was pregnant. I love the wolves. To be able to stand in the middle of a pack of wolves and have them accept you is incredible. The ravens amaze me with their intelligence and the coyotes are especially entertaining. My goal for the future is to learn more about the species we care for to better help them adapt to captivity and in rehab. I hope to continue to educate the public about the animals in our care and to be part of helping the new zoo blossom into awesome. I love to do animal impressions and can easily get the coyotes and wolves howling for the guests in the zoo. I have a small home and have happily raised my three children amid hundreds of animals in my care during the 20 plus years I have been working at the zoo, including Huckleberry the three legged bear.